Austria’s 4th largest city, birthplace of Wolfgang Amadeus Mozart, with an Altstadt (old city) listed as a UNESCO World Heritage Site since 1997, Salzburg is probably one of the most beautiful cities in Europe. The first settlements of Salzburg date all the way back to the Neolithic Age, and were merged into one city during the Roman Empire times.The city was named Salzburg, with means Salt Castle, honoring the barges carrying salt on the Salzach River, in the 8th century. Salzburg, as the capital of one of the Austro-Hungarian territories, became, through time, home for a large number of Protestant emigrants and emigrants from regions of the Kingdom of Hungary, as refugees from the war. Even if during the World War II, the bombing destroyed 7,600 houses and killed 550 inhabitants, the Baroque architecture was preserved and the city rebuilt, blossoming year after year. 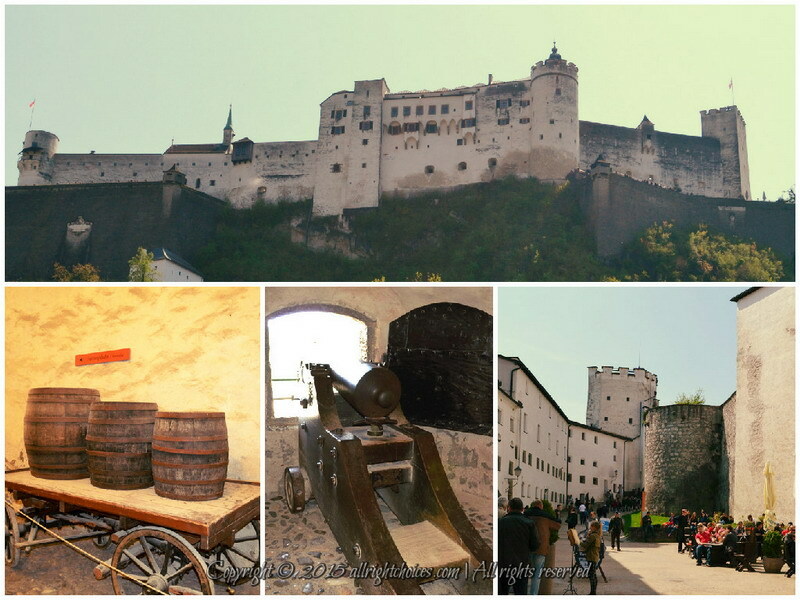 The High Salzburg Fortress, is located at an altitude of 506 m, on Festungsberg, a small hill situated in the heart of the city, which offers visitors probably the best view over Salzburg. Measuring 250 m in length and 150 m in width, Hohensalzburg is one of the largest medieval castles in Europe. The construction of the fortress, originally designed as a simple wooden fortification, began in 1077, under Archbishop Gebhard von Helfenstein, and was gradually expanded during the following centuries, until 1462, when the ring walls and towers were built, under Prince-Archbishop Burkhard II von Weißpriach. Even if the main purpose of the fortification was protection, the only time it actually came under siege was during the German Peasants’ War, when in 1525, the townspeople tried to force Prince-Archbishop Matthäus Lang out of his position, but failed. Nowadays, the castle, with various wings, chambers and a beautiful courtyard, is open to the public, and if you want to visit, you can get there either by cable car or by foot. As usual, I had to choose walking, so I can stop on the way, and admire the gorgeous view over the city. I must say, I wasn’t disappointed at all! Named after the 19th century painter Hans Makart, the bridge over the Salzach River is the most modern bridge in the city center, with 20,000 pedestrians crossing it everyday. However, this is not what the bridge is so famous for. The fence of the bridge is covered in a sea of locks, brought there by lovers from all around the world, which are meant to declare their eternal love. Either way, the shop owners selling them, are very happy and thankful for all the couples who feel the need to write their names on fences (not sure what happened to the good old romantic dates where people brought knifes along and carve their names on trees). 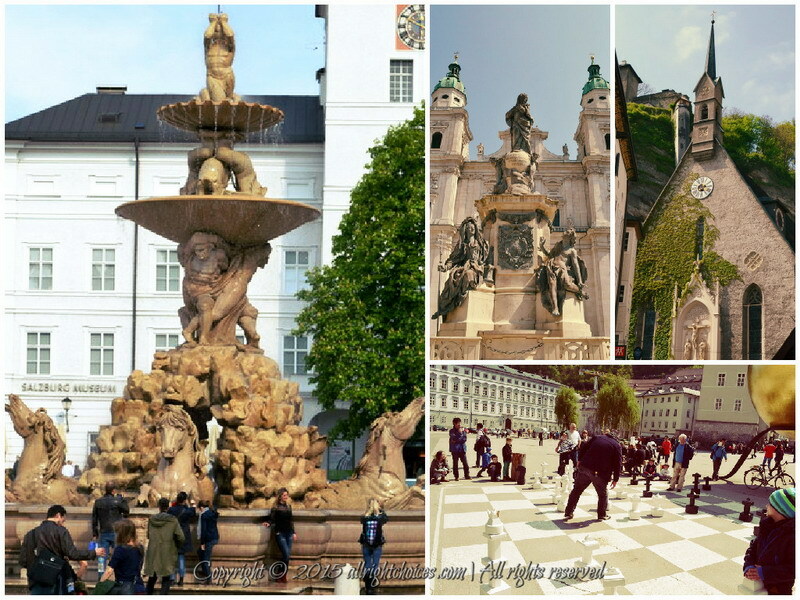 With plenty Romanesque and Gothic Churches and Cathedrals, a perfect blend of baroque and classical modernism buildings and a beautiful contemporary architecture found in Salzburg’s old town, the city is definitely not lacking variety. Regardless if you stop by to visit the historic center or the Alpine surroundings, Salzburg is full of culture, history and beauty, and ever since my first visit, it’s been on my top 5 favorite cities list. 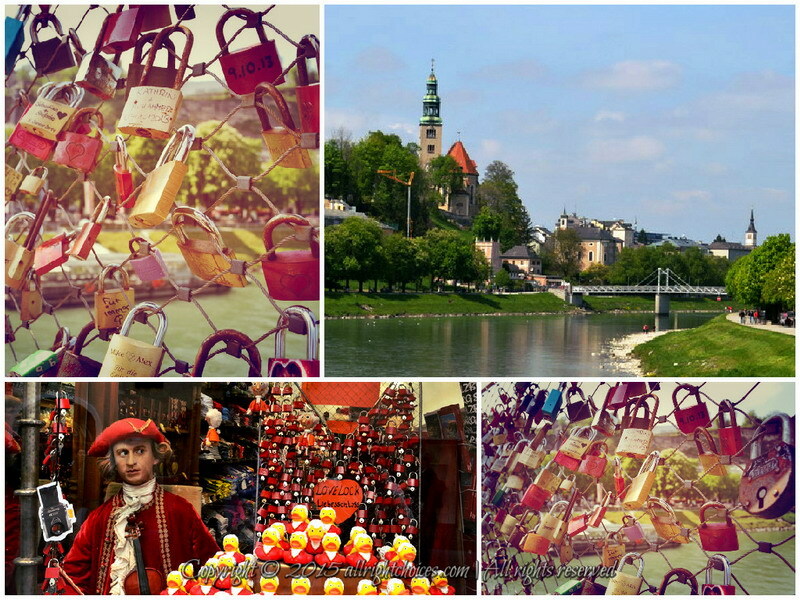 This entry was posted in Travel and tagged Alps, Austria, Hohensalzburg Castle, Love Locks, Makartsteg Bridge, Salt Fortress, salzburg by Lucy. Bookmark the permalink. “Yes indeed, the bridge fell down because of the weight of the love locks. Nowadays, they have to remove the locks every months in Paris to avoid anymore damages (and I’m sure they must do that in other places as well). The metal keys of the love locks are thrown into the rivers in many countries (because bridges are iconic in this trend), and may disturb the aquatic ecosystem beneath. Some people may think it won’t change anything in a polluted river like “la Seine”, or that one key won’t make a difference, but thousands !? If everyone reaches the same conclusion…. In addition, these love locks have started to appear in other remote places, like Iceland, where the environment is very sensitive. Just imagine the disaster and the damages done to the bacterial mats living in hot springs or bubbling rivers of Iceland ? This trend is an ecological disaster in my opinion… I was so pissed off when I saw these in Iceland during my last trip. I think it’s awful to celebrate the love shared between two people by destroying the nature at the same time. It’s an act of selfishness. Gin, I absolutely love your comment! I feel the same way about them… Besides destroying monuments (it happened in other places as well) t’s pollution and it’s an unnecessary type of pollution. Imagine every tourist would throw something in the water… I might be old fashion, but I don’t like to advertise the fact that I’m in love with someone. Love should be only shared between the two persons forming the couple. The rest of the world simply doesn’t matter. 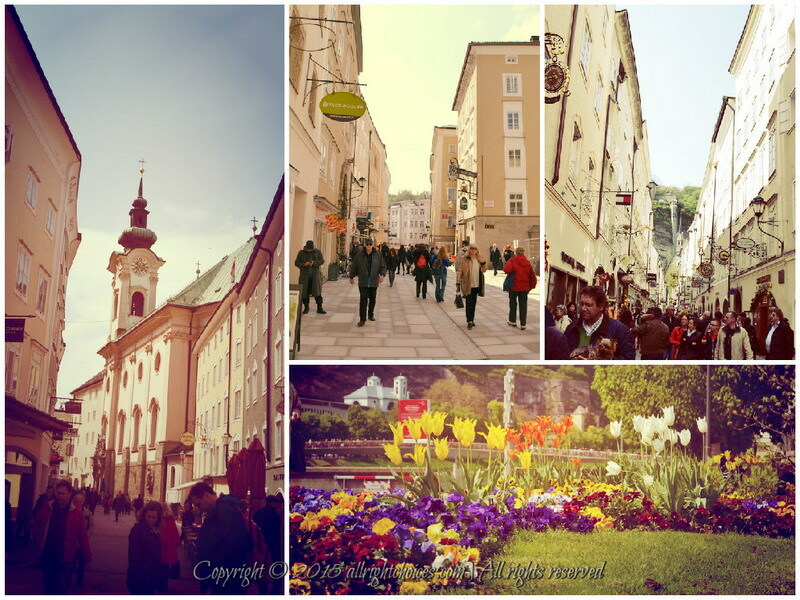 I’m sure you’d love Salzburg! I don’t know what it is, but the atmosphere overall made me feel so good over there! I totally love it, and the fortress is amazing. The view from up there is breathtaking 🙂 I hope you’ll see it in person, one day! Thank you, have a lovely week as well. Here the wind is really strong, 90 km/h, it’s an horrible weather. I don’t like throwing anything at all, unless I feed some ducks or fish 🙂 I hate to pollute the environment. We already do enough damage as specie, as it is. 150 km/H ?! that’s so scary…. I hope it won’t get worse. Hi Lucy! What a beautiful city! The mountains, river and fortress looks amazing! I love your pictures! Thank you so much for stopping by! 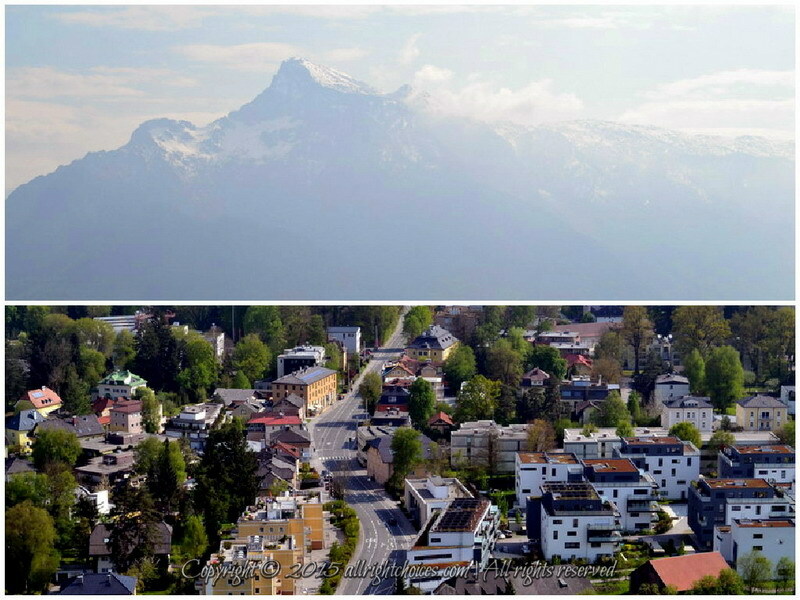 Indeed, Salzburg is absolutely beautiful. The streets, monuments, buildings, atmosphere, are just wonderful 🙂 I went there last year for the first time, and I’m still thinking about that trip. I would love to visit here as well one time. The atmosphere do indeed look wonderful! I hope you get to visit. I’m sure you will enjoy it a lot. I definitely did! Thank you so much for your lovely comment Francis! I’m afraid this is not a very popular opinion. Not sure why some feel the need to advertise that they are in love, and damage the environment, in the same time. I wonder if they even realize it. The city is definitely lovely. The atmosphere is one of the best I’ve been on so far, anywhere in Europe. And the best part, as you also mentioned, is the care citizens show for their culture and history. Thank you once again for stopping by. Have a lovely day! I hope one day you will get to visit it, in person. I’d love to hear what’s your impression on the city. I’m sure you’d absolutely love it. You too have a great day!!! I’d like to visit Salzburg in the future. I am a student of history so reading your post is like opening the pages a book. Thank you so much for your lovely comment! I feel humbled by your words. I hope you will get to visit Salzburg one day. If you love history, I’m sure you will enjoy it very much. It’s a gorgeous location, which takes you back in time. Have a lovely day and good luck with your studies! Salzburg looks so cosy and beautiful. Maybe I should go there, too?! 😉 Oh I see my bucket list gets longer and longer. I guess the love locks are the curse of our times, unfortunately. If you are in the area, I’d definitely recommend it. It’s a great addition to the bucket list 🙂 It’ has something very special and I’m sure you would have a great time visiting a part of our history. 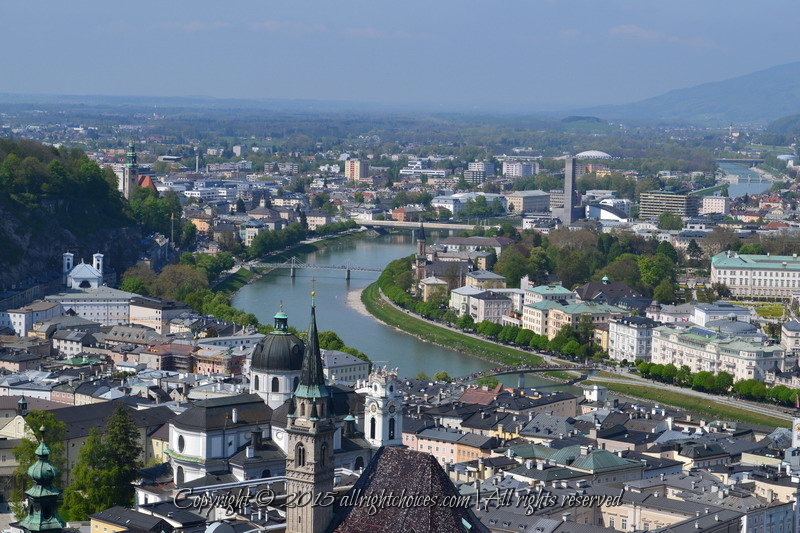 Looks like a beautiful city – the view from High Salzburg Fortress is stunning. For some reasons cities that have a river running through them always melts my heart (like Budapest). Thank you for reading! I can’t agree more! The more water, the more beautiful the city is. Amsterdam is my favorite from this point of view, but Salzburg has that something which made it very dear to me 🙂 I hope I’ll get to see it again soon. it was a wonderful experience. Have a great day! I love seeing the world through your lens! That makes me very happy 🙂 Thank you!